Berlin- Before May of 2007 I had no plans or any real desire to visit Germany’s capital. It’s not that I had anything against it, I just had other cities at the top of my to-go list. Little did I know that it would be the city that would leave the greatest impact on me in my epic tour across Europe. You see, that spring I decided to take a class on WWII history. It was not just any class. In true “Kelly style” I took one in which I could see for myself the infamous and notable sites of WWII and experience the history and implications of this tragic war. 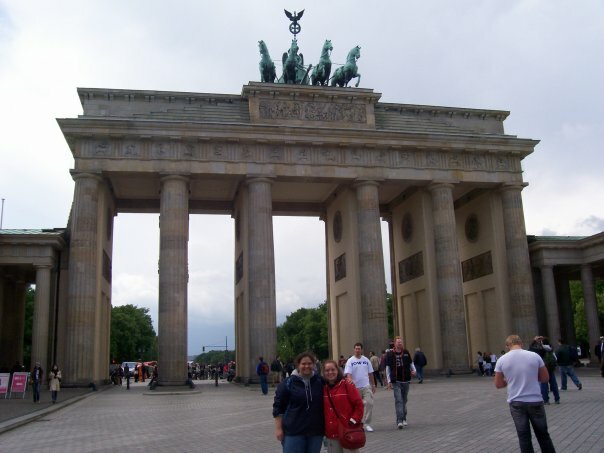 I didn’t know what to expect of Berlin, but I found it fascinating. Maybe it was because I had been so highly anticipating a visit to Paris (a city that I would later find to be disappointing) that Berlin caught me totally by surprise. I think more than anything it was interesting to see how far this city had come in such a short time. In only 62 years, Berlin had overcome complete structural and economic decimation, fascism, communism, foreign occupation, a cold war and a metaphorical and very literal wall of painful segmentation. Through all of this (albeit self-initiated) destruction, present day democratic Germany has emerged as the thriving economic powerhouse of Europe. It is the locomotive of the E.U. propelling the collective nations forward into the 21st century. The modernism of Berlin caught me by surprise. 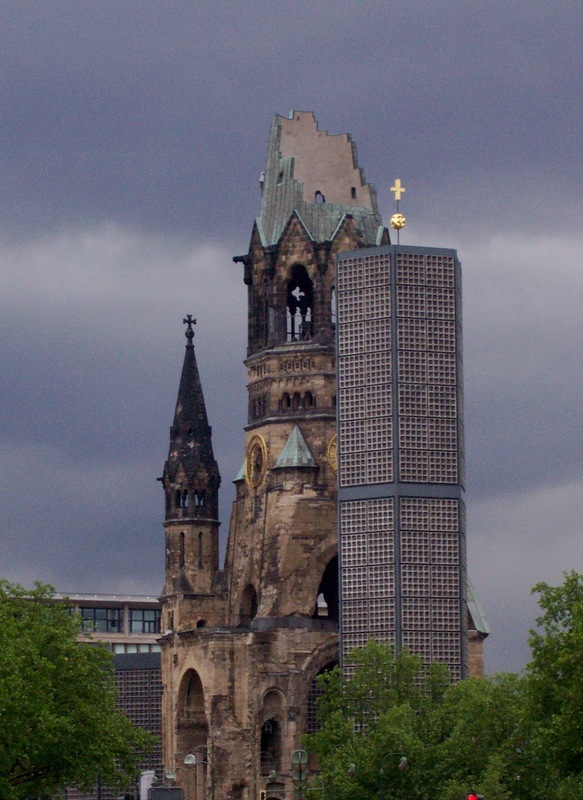 The city skyline that was destroyed during the bombing raids of WWII has been rebuilt creating a very contemporary metropolis unlike most other German or European cities. And in the classic German spirit it has been organized to the T. Everything has its place and is accounted for. Including the city’s trees! Leave it to the Germans to be the only nation to literally number every single tree with a little blue tag. 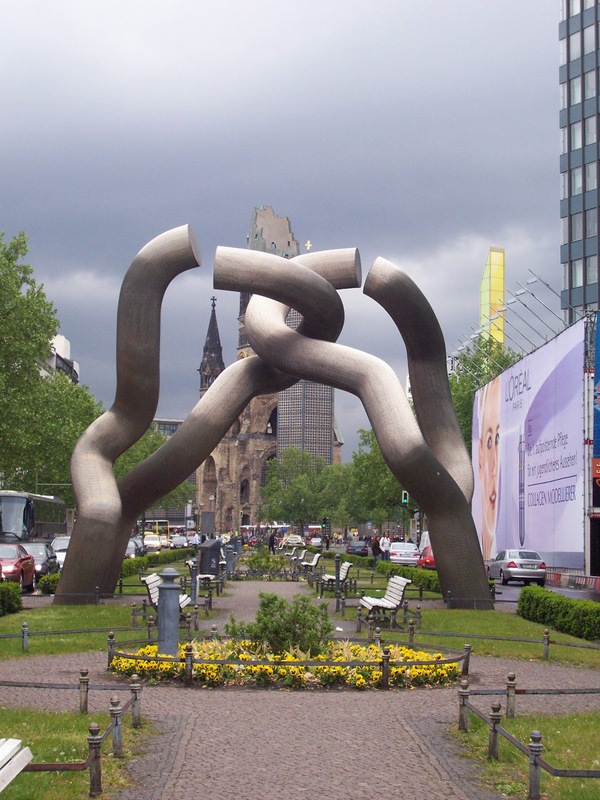 However, when you dig deeper, past the trendy skyscrapers of Potsdamer Square, and the clean (oh so very clean and orderly) sidewalks, you see some of the old scars left behind by the city’s dark past. 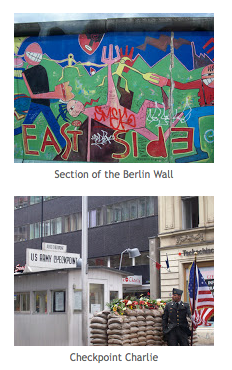 This contrast of New and Old Berlin was particularly biting. A tour through the city was a tour through modern history. I visited the Old Opera house in Bebelplatz square. It should be a place to celebrate the fine music, art and literature of Germany but instead it represents the location where the Nazi party burned over 20,000 books in 1933. 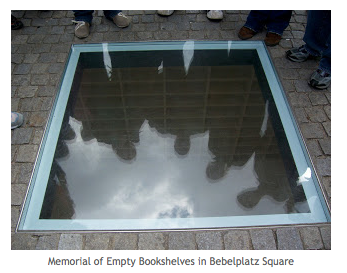 As I looked down into empty bookshelves encased in the memorial marking that notorious spot, I felt the lonesomeness of all those vacant shelves pinning for their lost works and ideas. I also stood on the East side of the Berlin Wall and felt its lingering sting of separation. I could sense the pain, frustration and tyranny this wall represented. As I walked along it I imagined myself to be someone living in East Berlin walking home from work, knowing that on the other side of this wall was unattainable liberty, prosperity, democracy, friends and family. I visited Checkpoint Charlie and heard the stories of the men and women who were so desperate for liberty, a liberty I take for granted more often than I care to admit, that they gave their lives in an attempt to cross a section of land that could be measured in yards, yet was as intangible as crossing the Sahara Dessert. How could something so close be so very far away? I walked past the Brandenburg Gate and I imagined it as it was in 1963 when J. F. K. stood in front of the Banner draped doorway. I wondered what he thought of the scarlet barrier placed there by the Soviets to purposefully prevent him from looking into the Communist East. I also heard the lingering echo of President Reagan’s 1987 speech pleading for reconciliation. And Finally as I effortlessly and peacefully crossed through the gate I could hear the cheers and feel the joyful, tearful elation pouring out of the thousands gathered here on that fateful day in 1989 when the gates were finally opened and Reagan, and the people of Germany, got their wish. That wall did come down, and Berlin was rebuilt. But it will forever have scars that no amount of modern buildings can conceal. You are standing in a maze of graves. Fifteen-foot tall steel tombs surround you in every direction and you can no longer find your way out. This sea of industrialized death is 5 acres of ugly anxiety educing confusion. 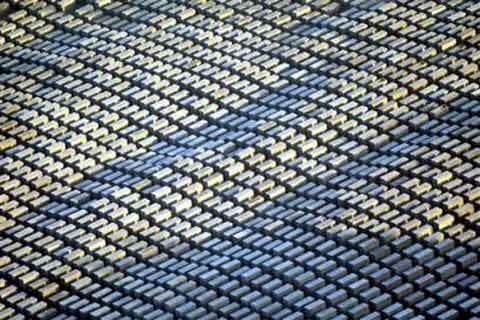 It makes no sense, yet there is something so eerily and unreasonably systematic about this grid of graves. It is almost as if this pattern of destruction was planned. Am I talking about a horrible nightmare? No, and at the same time an outstanding yes. 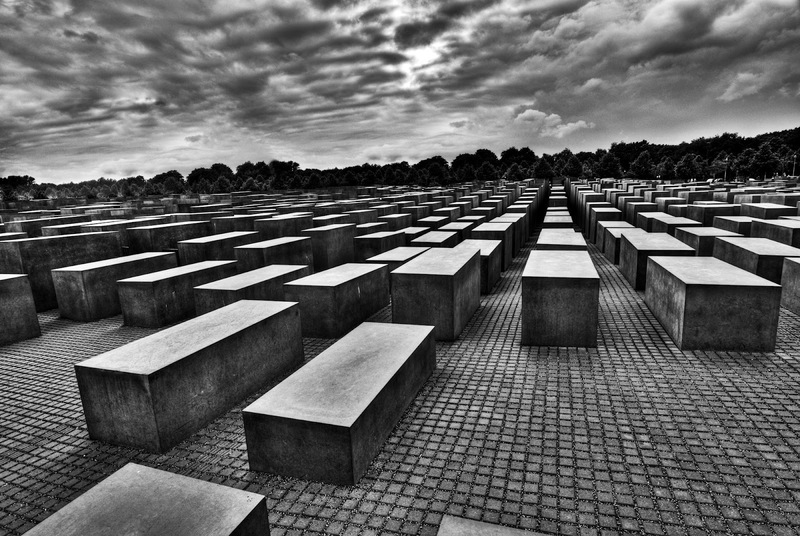 I have just described the Holocaust Memorial found in Berlin just south of the Brandenburg Gate. 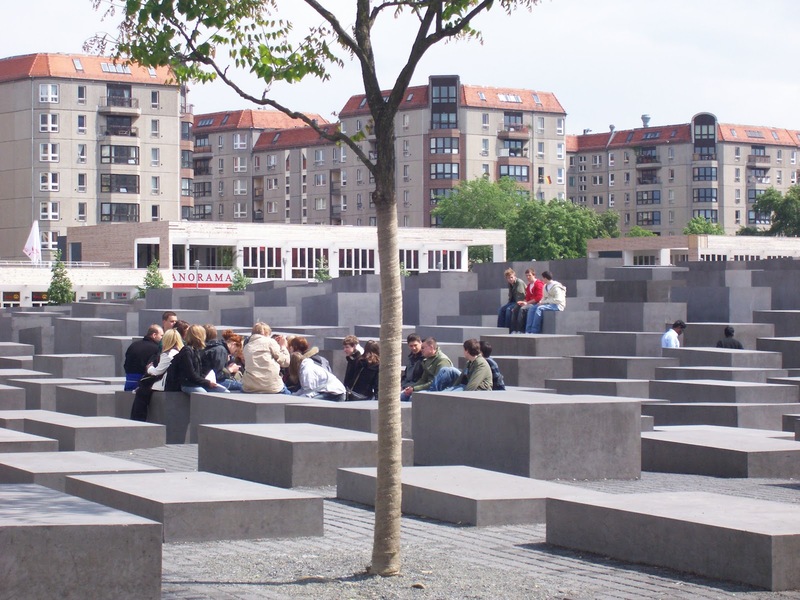 This controversial memorial is dedicated by Berlin to the millions of Jewish people who were murdered in the Holocaust. This memorial might get a lot of criticism from other onlookers, but I thought it was a brilliant and poignant representation of what happened in Germany over 65 years ago. 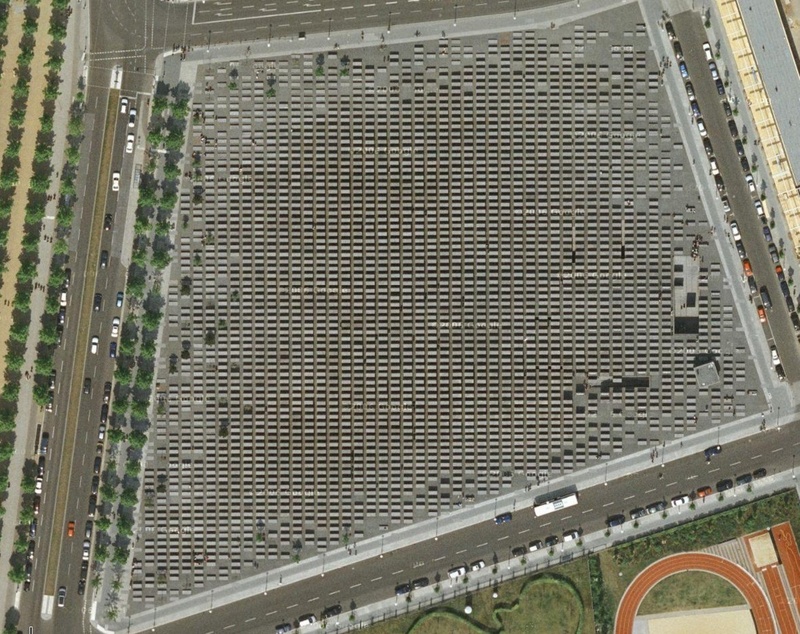 The memorial is literally a giant 5-acre section of the city in which they have constructed a grid of 2,711 steal rectangular slabs of varying height. The architect, Peter Eisenman, didn’t give much of an explanation for the design. Rather, he wanted each person to come up with his or her own interpretation. This is mine. The slabs of ugly concrete represent loss- unmarked tombs of stolen generations. 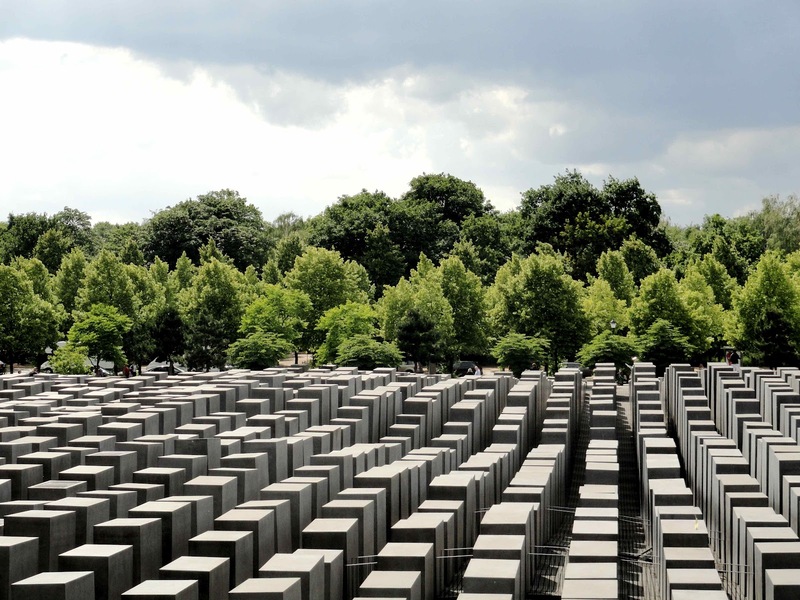 There are more than you can count, and when you look across the giant block of ugly, impersonal and industrialized nothingness the shear enormity of the memorials makes your blood run cold. 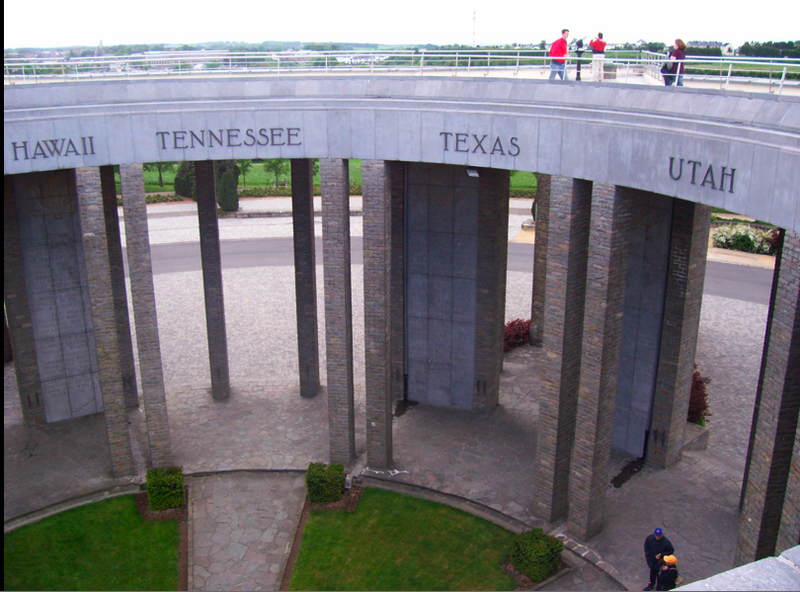 The memorial was built on a slope. This creates the initial illusion that all of the steel graves are the same size. 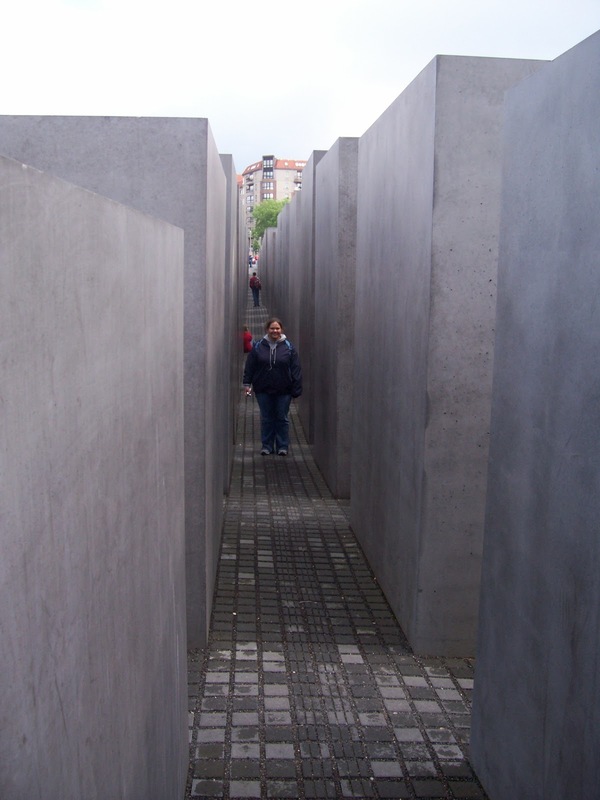 I think this symbolizes how little the world, including many Germans, knew about the monstrosity that was the Holocaust. Most of what was known was only the surface level until it was too late. When you get closer, the tombs on the perimeter are only an inch high, and as you walk towards the center they gradually get taller and taller. The symbolism here is particularly chilling. A systematized murder of 11 million innocent people did not happen overnight. It was a gradual slope. It started small, with propaganda and indoctrination and the “simple” practice of wearing a golden star. However, once you start going down that path you realize that the death has mounted up around you. What was once at your ankles is now at your knees. You are searching for a way out, but the grotesque train of genocide lead by an insane dictator has started and the powers at large will not be slowed now. Suddenly you look up and the graves are now taller than you and stretch in every direction. You can no longer see anything other than giant ugly steel slabs of symbolic death and annihilation. A series of screaming questions run across your mind. Why didn’t anyone stop this? How did they let this happen? Why didn’t anyone say anything when the graves were only ankle high? Is not even one death worth standing up for? How did it get to this point? We stayed in a small hotel that was run by a family who also made us a meal of quiche, and some type of beef stew that was truly fantastic. And there was bread…lots and lots of bread. They kept sending it out with the family’s adorable 8-year-old son. I accidentally scared this unsuspecting bread deliverer by asking him how old he was. He replied in very broken and loud English “ MY NAME IS ALLEN”. This was clearly the only phrase he knew in English. This struck me as funny because the only French I knew was “ja ma pel Claude” (My name is Claude). In my hurried excitement to communicate, I screamed this phrase at the little boy, which undoubtedly startled him. The primary reason for his confusion was that I used the masculine name Claude instead of my own. That would be the French equivalent to me shouting that my name was Frank or Bob or Bill. Needless to say, my effort at communicating in French was not successful and our table did not receive any more bread. Even though it is quite charming, this small village would be easily overlooked by the traveler if not for its historical significance in WWII. 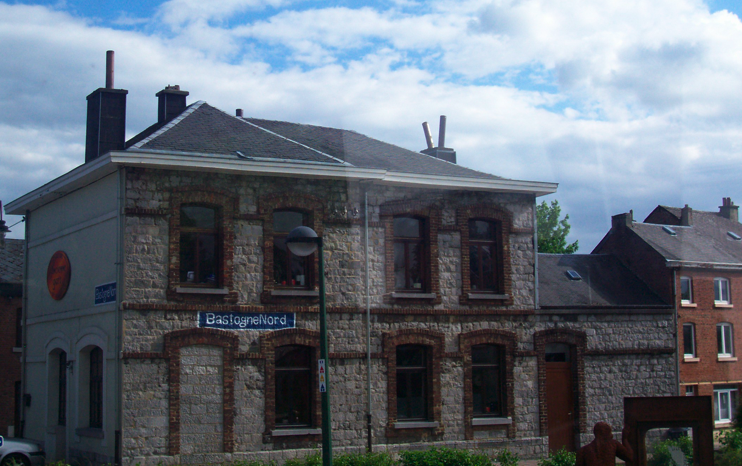 In an effort to capture the important harbor of Antwerp, near the end of 1944 Germany had attacked the American troops in the area and occupied this small Belgium village. This siege initiated the infamous Battle of the Bulge. A few days later, the 101st Airborne Division and others lead a counter-attack. After several days of intense and deadly fighting the US troops were surrounded and left to fight the harsh winter elements with diminishing supplies. As a visitor you can wonder the dense forests where these brave American men fought, struggled and died. You can see where they dug foxholes in an attempt to stay warm and safe from exploding debris. Nearly 76,890 US soldiers died during this long and arduous battle, which is more than 7 times more than those who died on D-Day at Normandy. 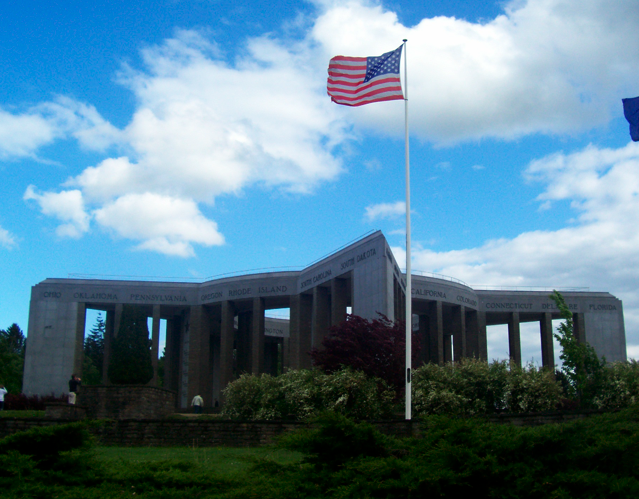 The people of Belgium were so thankful for the sacrifice of American soldiers that they built the giant Mardasson Memorial in 1950 and dedicated it to the American men who died to protect and liberate the people of Belgium. This memorial is tasteful, beautiful and massively powerful. It is a pentagon raised to the sky by giant columns that are inscribed with the historic depictions of this tragic battle that highlights America’s classic resilience and perseverance. When you climb to the top of the structure you can view the surrounding battlefields of the past. You realize these now peaceful trees were once audience to all the horrors the men endured during those harsh winter months. If those trees could talk…what would they say? What tragedies did they witness? 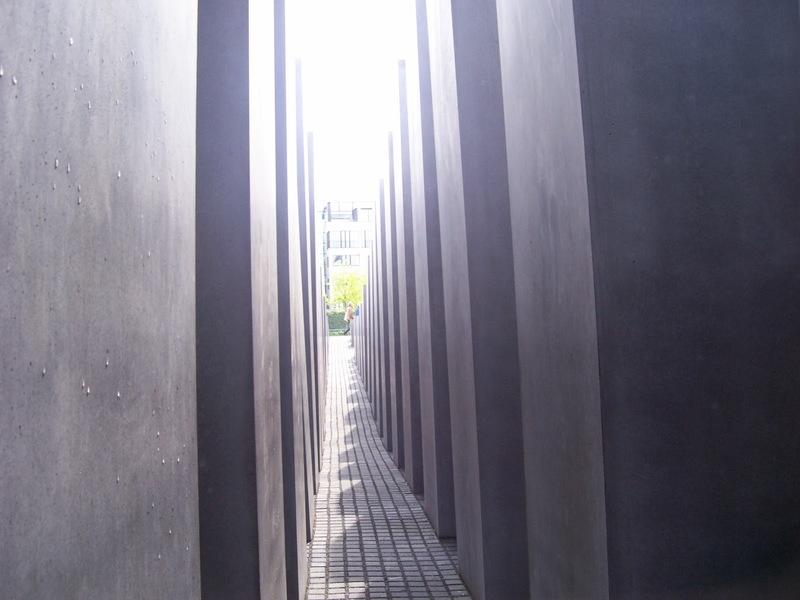 The most moving moment of this experience was when I read an inscription on one of the giant columns. On it was a heartfelt thank you from the people of Belgium to the American men who fought and died for their freedom. The words brought tears to my eyes for many reasons. Most significantly I felt the true unfiltered gratitude the Belgium people had for the American Men who choose to stand up and fight for the freedom of a people they had not met on land thousands of miles from their own homes. At that the time of my trip the US was involved in another war attempting to promote liberty and freedom. However, US soldiers were not being met with gratitude but instead with contempt. It was therapeutic to see that our actions and sacrifices for the preservation of worldwide liberty were appreciated and that at least the people of Belgium understood our sacrifice and were eternally grateful. Mirroring the giant memorial stands a very informative and interactive WWII museum, which is also shaped like a giant star. This museum is a haven for those who enjoy artifacts from WWII history. It highlights some of the more interesting parts of the battle. Towards the end of 1944 the US men had very little food or supplies to protect them from the wintery elements of that cold December and because of the fog there was no way to get the supplies they desperately needed. The Germans asked the struggling US Forces for their surrender, but General McAuliffe’s notoriously brief and gutsy reply was one simple word “NUTS!” The next day the fog cleared which allowed for much needed supplies to reach the men and they were able to hold on until General Patton and his armored tanks broke the deadlock thus ending the battle of the bulge and took the Allied forces one step closer to the end of the War in Europe. Although, you will never hear it from a member of the 101st airborne division many people make Patton the hero of this battle. His fleet of tanks ended this battle and saved many lives. There are several memorials in this area dedicated to him and his fleet of tanks. 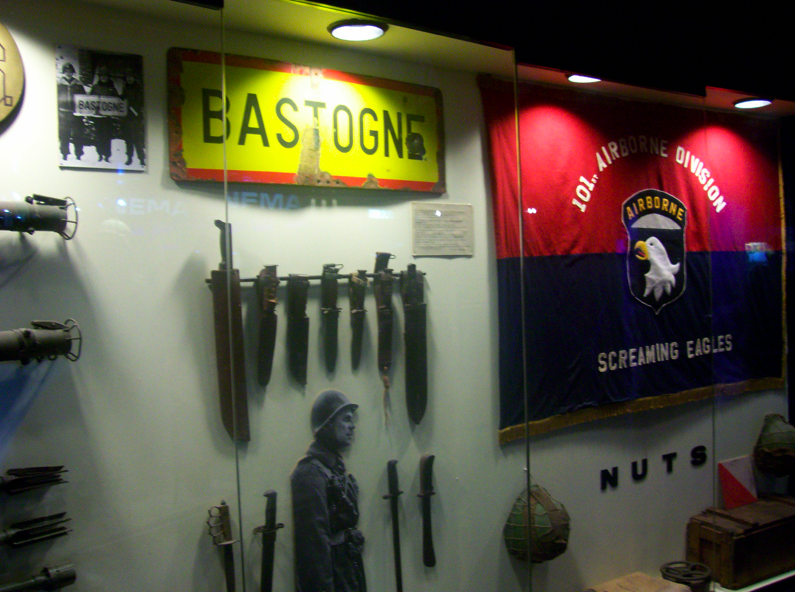 Bastogne was my favorite stop in terms of WWII battle significance. If you are interested in WWII history it really is a must visit in terms of relevance to the war and how well the war is chronicled in the museum and monument. 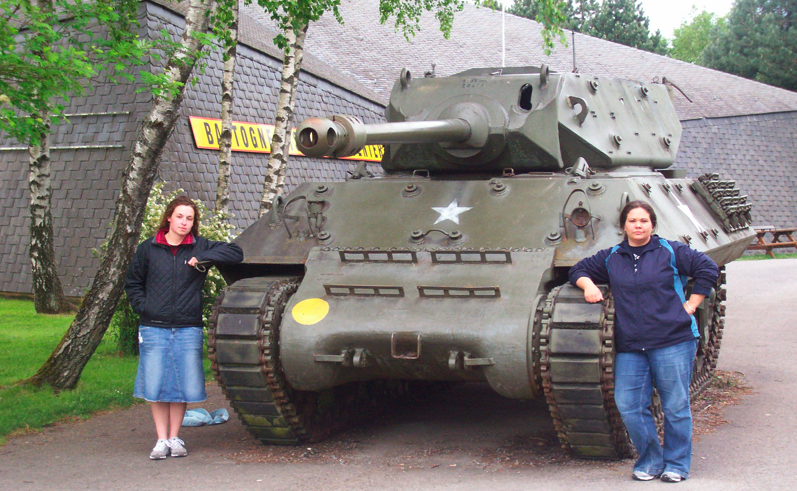 I loved my trip to Bastogne.